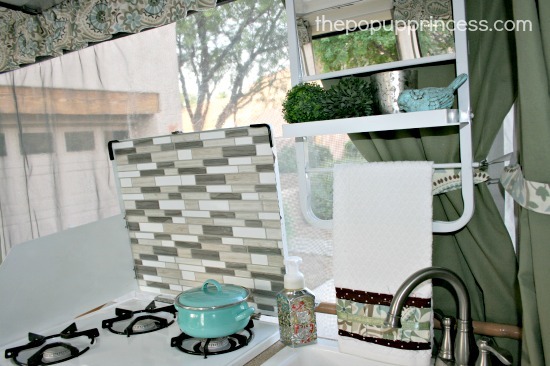 Adding a tile backsplash to my camper is something I’ve wanted to do since we first bought our little Coleman Santa Fe. It adds so much visual appeal and makes the kitchen area feel a little more homey. 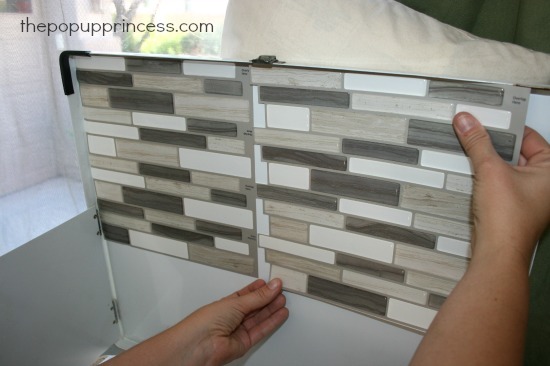 I wasn’t sure how to incorporate the tile look into the kitchen of our camper, as we don’t have a traditional backsplash, and I didn’t want to add the extra weight of ceramic tiles. A few months ago, one of my RV friends told me about adhesive vinyl tiles, and I thought they would be a perfect solution to the weight issue, but I still didn’t have a place to put them. Then I got to work cleaning the inside surfaces. 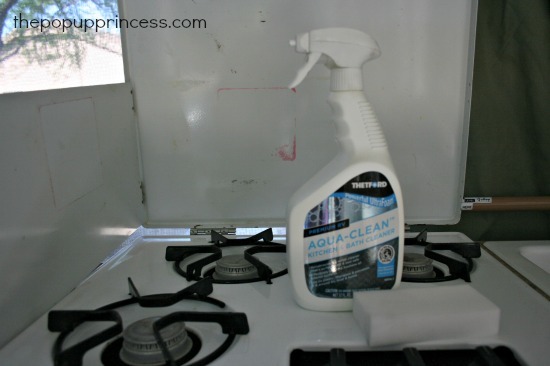 I used my Thetford Aqua-Clean and a Magic Eraser to remove most of the grime. A little Goo Gone removed the rest of the adhesive. Then I wiped everything down with rubbing alcohol. I searched several Home Depots in my area, but I only found one that carried the Smart Tiles, and they only had one sheet of the color that I needed. 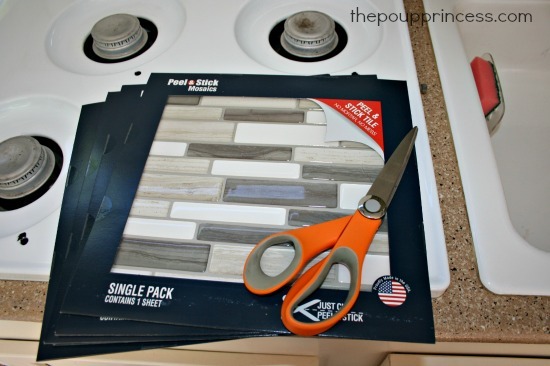 I spent a few hours on Amazon–they honestly have a great selection of adhesive vinyl tile--but in the end, I was impatient and didn’t want to wait to have the tiles delivered. We made a quick trip to our local Lowes and hit the jackpot! They had at least five different styles of adhesive vinyl tiles in stock, and one was just perfect for our color scheme. Once I pulled the first tile off of the stove lid, it was pretty much ruined. I also learned that things will go much smoother if you only remove part of the paper backing. 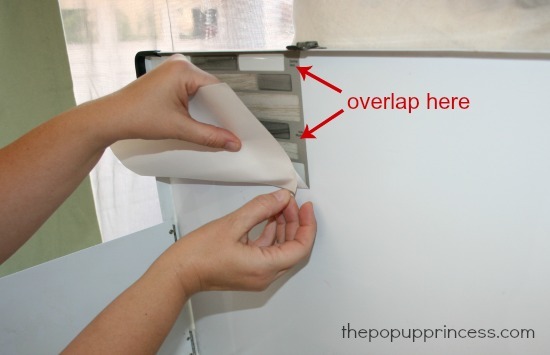 Press the tile into place, and then remove the bottom half of the paper backing. This worked much better. Once you get that first tile in place, you can then begin to overlap your tiles. After that initial setback, the rest of the installation was a breeze. Just keep lining up the tiles and removing the paper backing. 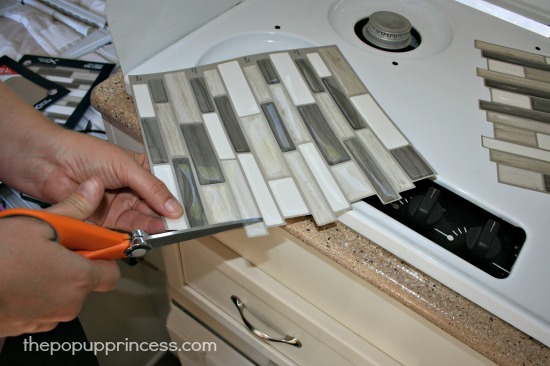 Once you hit the end, you can use scissors to trim down your tile pieces. They cut easily with sharp scissors or a utility knife and a straight-edge. 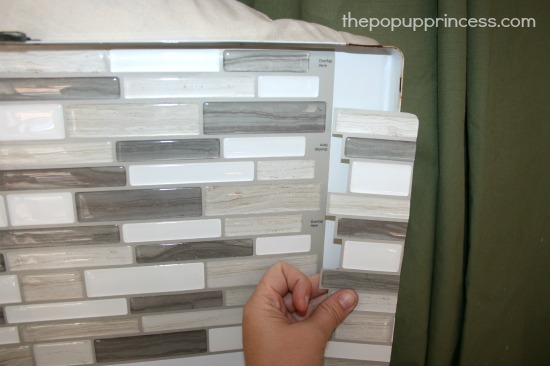 Keep the extra pieces of tile, as they all fit together rather like a puzzle. 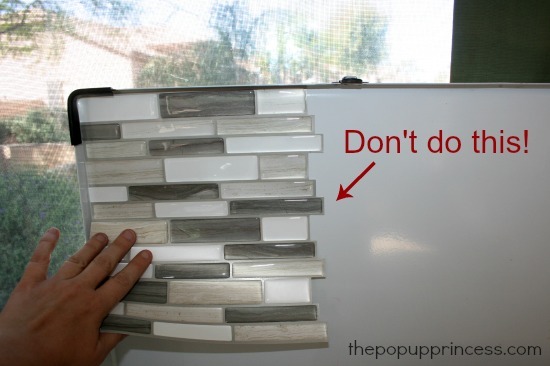 You can cut the leftovers into smaller pieces in order to use as few tiles as possible. I used my scissors to round the corners of the tile so it would fit snugly inside the lid of the stove. And that’s really all there is to it! It took all five tiles to complete my backsplash, but had I not made the little mistake above, I could have completed the project with just four. It’s also worth noting that the package recommends keeping the vinyl tiles away from open flame. 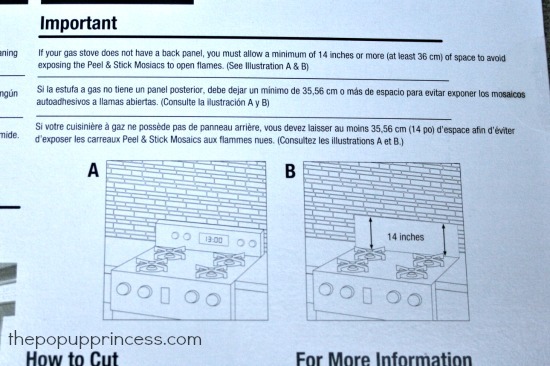 They recommend installing the mosaic tile at least 14″ away from the stove burners. I didn’t do that primarily because I didn’t like the look it would have given my backsplash, 😉 but I also figure that we use the stove infrequently enough that it likely won’t be a problem. 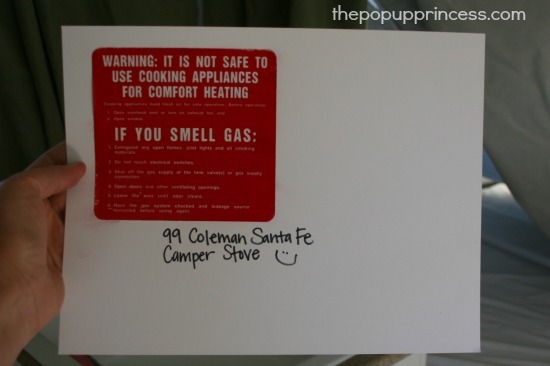 If you constantly cook on your camper’s indoor stove, you may want to heed the manufacturer’s advice. I am absolutely thrilled with how it all turned out. We also installed a Coleman Vanitymate that we bought off eBay last weekend. It hangs over the sink and holds towels and toiletries (although, I loaded it up with candles and cute stuff for the pictures 😉 ). I’m not sure how I feel about it yet, as we had to drill into the ceiling, and that’s something I don’t really like to do. It also made closing up the camper a little harder. I’ll keep posted you all on our thoughts about it once we’ve used it a bit more. 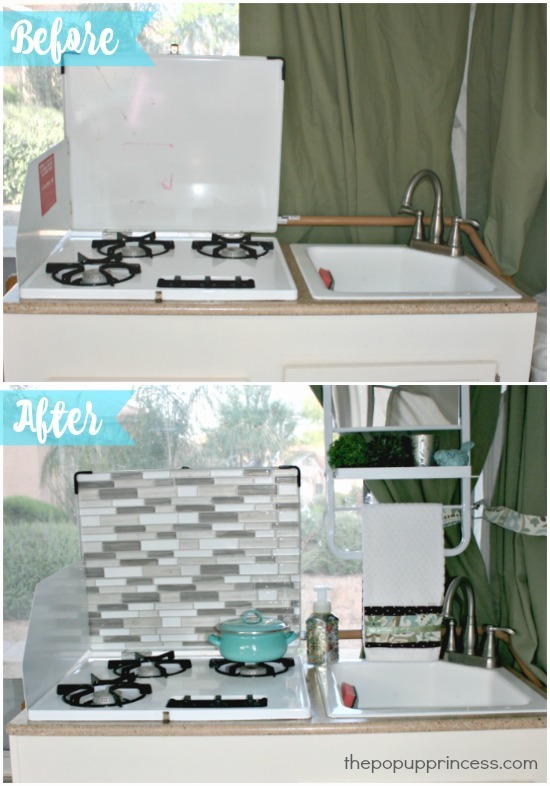 Those two little weekend projects completely transformed my kitchen area. I love how the vinyl tiles covered my stained stove and made it look brand new again. What a difference, right? 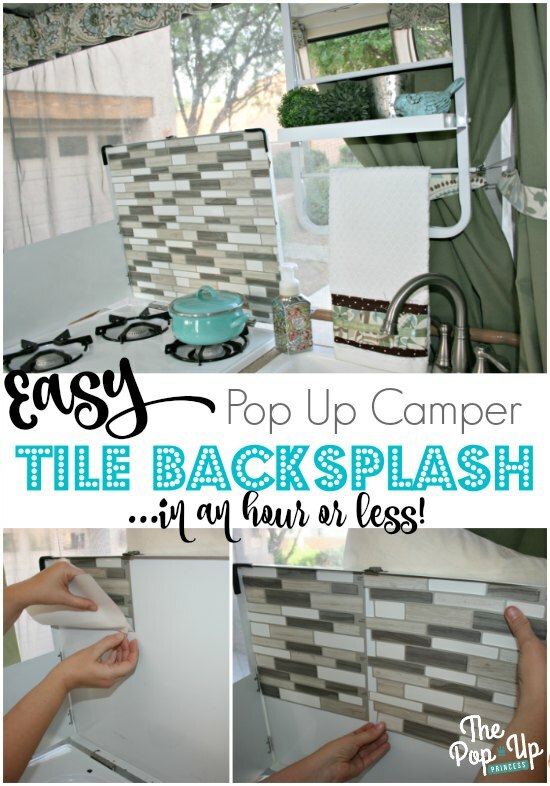 So have you installed a backsplash or used those awesome vinyl tiles in your camper? I’d love to hear your tips and see your pictures. You can email them to me at larissa@thepopupprincess.com or head on over to our Facebook page and post them there. This looks great!!! I so want to tackle this. It is a very nice look!!! I love the faucet that is in the little lady.. mine is the typical pump type.. can it be replaced to one of these beauties? 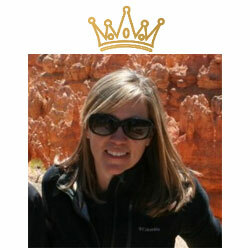 Hey just found your blog and I’m loving it! We’re new to folding campers (although not to camping!) And have recently bought a sterling pennine and its in really good shape so we won’t be doing any major renovations. However I’m loving picking up all these great tips on improvements. I wondered what the hanging kitchen organiser I spotted in some or your pictures is? Where did you get it and how it it attached? Aw, thanks, Lindsay. 😀 That organizer is a Coleman Vanitymate. They are extremely hard to come by, but there may be a few more left on eBay. Honestly, I’m still undecided on whether it was a good idea. It tends to make the camper a little harder to close up. Have fun on PEI. It sounds like a blast! Send pictures! Hi Larissa. I know this is an older post but I was wondering: I use my stove all the time an it is an ugly stainless mess. 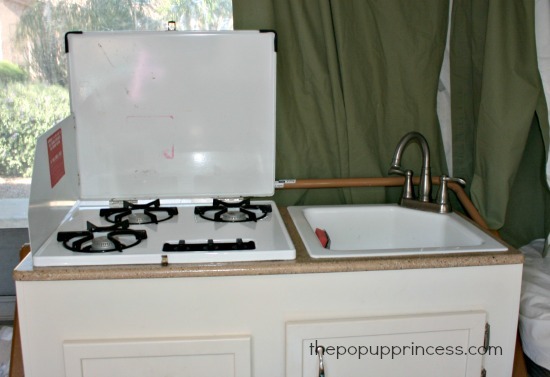 Has anyone had any suggestions on what to do to cover the lid and make a nice backsplash when you do use your stove? I’m loving all your ideas! I was wondering…since some time has passed now, do you you still sorta regret the coleman vanity (since it made it harder to close up the camper?)? Just wondering since we are doing some renovations and trying to figure out how to better organize that area. And I really liked that vanity! 😉 thank you! 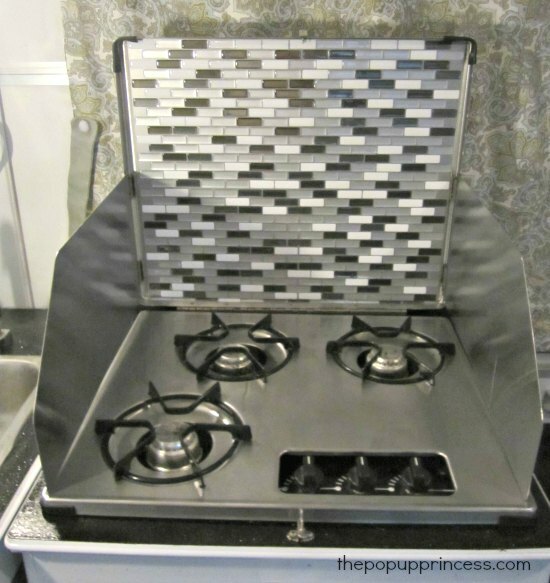 This looks adorable, but with the recommended 14″ space between these tiles and a burner, how do the plastic tiles not melt or ignite when they are SO close to your gas burners? How have they held up since you posted this? Just curious on the long term result. thanks! Where is the mirror from?? It is called a Coleman Vanitymate, Jess. Coleman doesn’t make them anymore, but you can sometimes find them on eBay.